The ancient Babylonians were probably the first people to use fingerprints for identification; people left their marks on clay tablets detailing business transactions. Fingerprints were also used on important documents in ancient China. 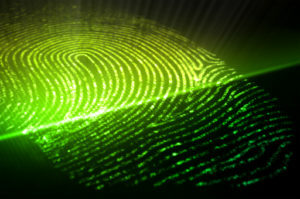 The idea that an individual’s fingerprints might be unique was first suggested by the German JC Mayer in 1798, however, it wasn’t until two years later that 1880 Henry Faulds published an article advocating the use of fingerprints for criminal identification. Sadly, law enforcement agencies received this ground-breaking news with little interest. Faulds’s discovery did find its way to Sir Francis Galton, via Galton’s cousin, Charles Darwin, but it took Galton eight years to get around to the study of fingerprints. In 1892 he published a book entitled Fingerprints which described a system for classifying them. Footwear impressions (sometimes called shoe prints but NEVER footprints) can be found at most crime scenes. They may be visible or ‘latent’ (i.e. not evident when viewed with the naked eye), but techniques used to enhance fingerprints may also be used to enhance footwear impressions. They can even be recovered by using static electricity to lift dust out of carpets. 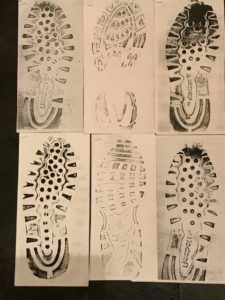 Once recovered, footwear marks can be conclusively linked to the shoe(s) that made them, by comparing the size, pattern and wear on the sole, but damage features on a shoe impression are what really make them unique. These are the little nicks and cuts that happen when you step on sharp stones, thorny twigs or pieces of broken glass – and their shape and distribution are completely random. Alphonse Bertillon (1853-1914) was a pioneer of forensic science. Born in Paris, both his father and grandfather were interested in the applications of statistics in scientific method, and Alphonse inherited their scientific minds. In 1879 he became a clerk in the Prefecture of Police. His duties were to copy out identification forms that no one looked at because they were largely works of fiction on the part of police officers who were paid 5 francs for each one they produced. Bertillon was determined to produce a form that was fit for purpose. Drawing on the skills he had learned from his father he came up with an identification system that involved taking eleven ‘key’ measurements of different parts of the body, that he believed could be used collectively to identify an individual. It took him until 1882 to persuade his superiors to try it out, but it soon scored some successes and Bertillon’s place in scientific history seemed assured. Unfortunately the old computer maxim, ‘Garbage in, garbage out’ applied just as well to bertillonage. The system only worked if measurements were taken with precision, and this proved beyond the abilities of t he average policeman. 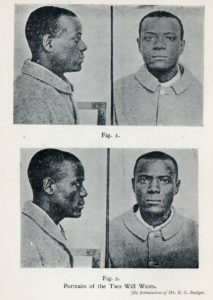 Errors crept in, and the end came in 1903, when it was discovered that two unrelated prisoners in Leavenworth Penitentiary who looked very similar, also shared almost identical measurements. Incredibly one was called Will West, the other William West. But Bertillon was onto something – it just took another hundred years to get there. 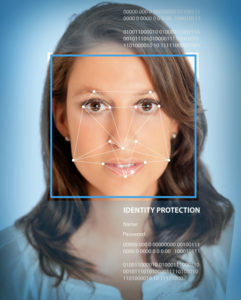 Modern facial recognition technology relies on Bertillon’s method: taking multiple measurements to establish a person’s unique morphology. . . Although admittedly it requires a much larger number of measurements and greater accuracy. And finally, for this session, some years ago there was quite a stir about ear prints. 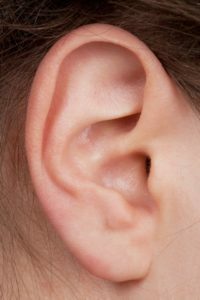 A method was devised for comparing ear prints with suspects’ ears, and several convictions relied on the technique. However, a murder conviction was overturned after it was demonstrated that DNA within the ear print proved that the print was not made by the accused, and the technique was discredited.